Here’s a release I missed. The second in the Joe Hunter series hit bookshelves in the UK last week. I had intended to ask Matt Hilton some tough questions about his latest thriller, but time slipped away from me. But for those you want to know more about Joe Hunter and his world can head across to the Arrowsake Alumni and join in the discussion. Joe Hunter doesn’t like bullies. So his latest job – saving a young woman from her bully boyfriend – is a no-brainer. Hunter’s only worry is that the man who hired him is looking for more than protection for his daughter. One thing Hunter has never been, and never will be, is a killer-for-hire. As it turns out, the vengeful father isn’t the only one who wants the boyfriend dead. Soon Hunter is face-to-face with a contract killer who takes his work very seriously. Dantalion has a talent for killing and keeps a list of his victims in a book chained to his waist. There is a new literary hero on the scene and his name is Joe Hunter. Hunter arrived on the scene in May in the thriller Dead Men’s Dust. 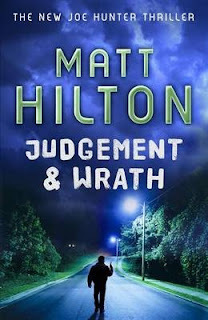 Now six months later, Joe Hunter returns in his second bullet-riddled adventure Judgement and Wrath which is out now in the UK (sorry US readers – you have to wait until May 2010). To read my review of Dead Men’s Dust, click here. To visit Matt Hilton’s website, click here. Or to visit his blog, click here.